Thursday, our last full day in Orlando, was supposed to be the relaxing day. After four frantic and fun filled park excursions, we would plant our chairs at the edge of the ocean and spend the day soaking up rays while the children built sand castles and searched for sea shells. But someone forgot to tell Anna about our plans. Not that she would have cared ether way. Since she’s a tropical storm. We awoke to a steady downpour outside our hotel window. Checking the weather forecast it predicted a one hundred percent chance of rain. Looked correct so far. We were originally undecided if we should head west to the Gulf of Mexico, with warmer waters and more pristine beaches or to head east, to the Atlantic Ocean, so the Twins could finally say they’d seen the ocean. But Anna decided for us, since she was coming ashore in the west. So we pointed the Ford east and set our sights on a soggy ocean visit. Ever the optimists, we packed everything we would need for a beach stay: beach towels, swim wear, beach chairs, sand castle building equipment and, for me, a book. We chose Coco Beach, just over an hour away and for the first 55 minutes of that hour, it poured. But a curious thing happened just as we reached the beach. The rain stopped. Not the wind, it continued to whip around the trees like a child shaking a baby rattle. But the rain had stopped. 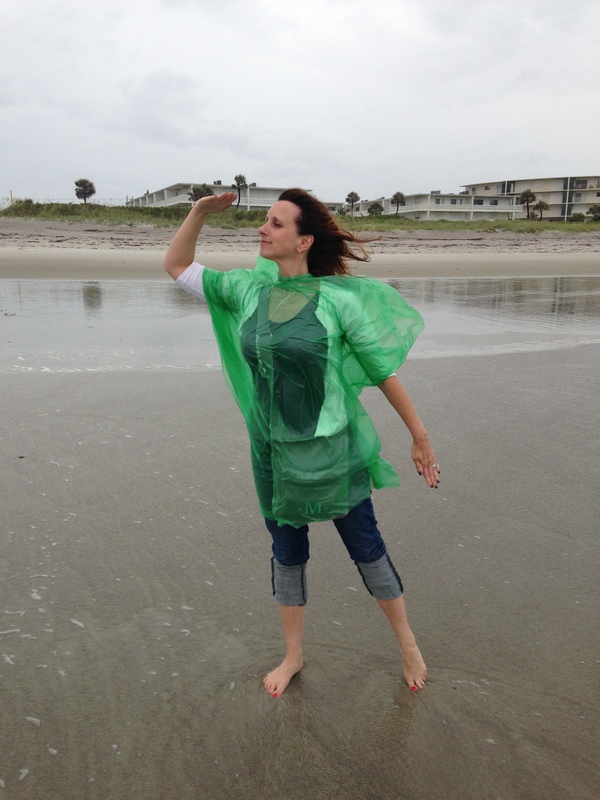 Taking advantage of the lull, we donned ponchos, kicked off our shoes and strolled down the beach to the waters edge. 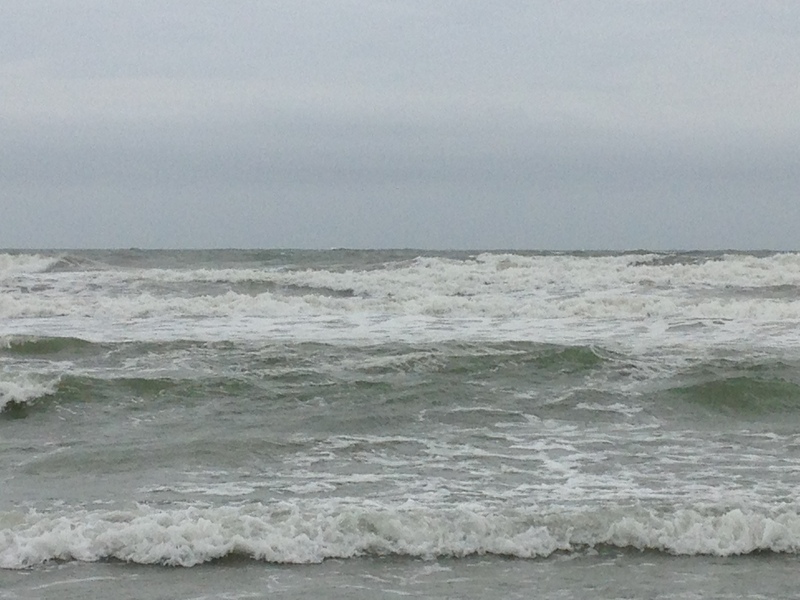 The Atlantic did not look happy to see us, hurling her waves against the shore in an effort to keep us back on the sandy beach. We managed to wade in about knee high, the water cold. But the kids (and truth be told, the adults) laughed and giggled with every wave. Our ponchos were flying around in a fierce attempt to leave our bodies, most of the time streaming behind us on the wind, making us look like a beach going group of caped super heroes. Alas, we were only able to stay on the beach about fifteen minutes. To the south, we watched a curtain of rain make its way up the beach, swallowing from view once visible condos, and chose to make the mad dash back to the car and then the drive back to the hotel. I’m glad we went and the children got to play in one of the planet’s biggest ponds. We’ll be back to the ocean, hopefully later this summer, when we will be more worried about sun burn and jelly fish than Tropical Storms and ponchos.